As the first reggae artist to win a Grammy Award, Black Uhuru have been called the best of the second generation of artists from Jamaica. They originally formed in the Waterhouse district of Kingston, Jamaica in 1977 and released their first record later that year. Uhuru means 'freedom' in Swahili. Black Uhuru's breakthrough came in 1980 with the brilliant 'Sinsemilla', which features Sly Dunbar and Robbie Shakespeare as the rhythm section and the album's producers. In 1981 Black Uhuru released Red, for many their best album, and the following year, Chill Out – both albums again produced by Sly & Robbie. It was Anthem, released in 1984 that won the band the first Reggae Grammy and it's not difficult to hear why as it features the vocals of Michael Rose and Sandra 'Puma' Jones, whose skills are given prominence by Sly and Robbie's slick production. The opening track from Anthem, 'What is Life', got a lot of attention and charted in Britain. Their album Brutal from 1986 includes the single 'The Great Train Robbery', which also appears on the soundtrack of the Grand Theft Auto: San Andreas video game. In 1989 the band opened for the Rolling Stones; Keith Richards had recorded with an earlier incarnation of the group prior to signing for Island Records. Black Uhuru maintained their high quality despite numerous personnel changes in their 40-plus-year history. They were, according to Reggae: The Rough Guide, "The most dynamic and progressive reggae act of the 1970s and early '80s." Formed by Ervin "Don Carlos" Spencer, Rudolph "Garth" Dennis, and Derrick "Duckie" Simpson. When the group experienced difficulties securing a record contract, Spencer left to pursue a solo career and Dennis joined the Wailing Souls. Simpson, who remained the thread throughout Black Uhuru's evolution, reorganized the band with Errol "Jay" Wilson and quivery-voiced lead vocalist Michael Rose, compared by Trouser Press to "a Rasta cantor." Accompanied by the rhythm section of Sly Dunbar on drums and Robbie Shakespeare on bass, Black Uhuru created a sound that made them a match for any reggae ensemble. Their debut album, Love Crisis, released in 1977, included the anthemic hit 'I Love King Selassie'. Three years later, the album was remixed and released as Black Sounds of Freedom. With the addition of harmony singer Sandra "Puma" Jones, an American woman who held a master's degree from Columbia University and was a former member of the all-female group Mama Africa in 1981, Black Uhuru entered their most commercially successful period. In addition to recording a memorable studio album, Red, and an exciting live album, Tear It Up, the group reached its peak with the release of Anthem in 1983. Remixed and revised for release in the United States, the redone version was re-released in Europe shortly afterwards. Despite winning a Grammy, internal problems caused the band to splinter the following year. Rose was replaced by sound-alike Junior Reid. Jones and Reid remained with the band until 1989. Although Reid left when visa problems prevented him from touring, Jones, who was replaced by Olefunke, was forced to step down after being diagnosed with cancer. She died on January 28, 1990, and was buried in her home state of South Carolina. The original three members -- Simpson, Spencer and Dennis -- reunited to record a trio album, Now, in 1990, they continue to tour and perform. Released in 1984 this album won the band the first Reggae Grammy and it’s not difficult to hear why as it features the vocals of Michael Rose and Sandra ‘Puma’ Jones, whose skills are given prominence by Sly and Robbie’s slick production. The opening track from Anthem, What is Life got a lot of attention and charted in Britain. During the period when Black Uhuru featured both Michael Rose and Puma Jones, the group increasingly incorporated elements from outside of reggae tradition into their roots-based music. Thanks to Sly & Robbie's rhythmic presence and studio wizardry, though, the band was successful at pushing the envelope without losing their reggae credibility. Unfortunately, the line was crossed during the production of Anthem. For one thing, the crossover musical strategies deployed on the album are blatant. The radio single "Solidarity" was the first track recorded by the group that was not self-penned. It features a sugary synthesizer melody, and other tracks utilize a rocking rhythm guitar lead ("What Is Life?") or an R&B song structure ("Elements"). Still, the fault lies primarily with the sound mixing, which purposefully de-emphasized the bass while adding trendy pop flourishes. Since Anthem won the first reggae Grammy in 1984, this strategy served its purpose, but the mix on Anthem pales in comparison to the mix on the short-lived import version. By foregrounding the bass sound and emphasizing more time-honored instrumentation, the import's mix makes reggae powerhouses out of "Try It" and "Botanical Roots" and infuses the import single, "Party Next Door," with a truly infectious and danceable spirit. In this mix, the album's pop innovations do not overpower the music's roots connection, and Island eventually endorsed it as the "original mix" on the Liberation anthology. That collection completely snubs the domestic versions, featuring every Anthem cut in its import mix, often in a "previously unreleased full-length version." 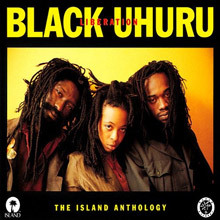 In essentially reissuing the import album this way, Liberation displays Black Uhuru's music in the most advantageous light. The domestic release of Anthem, however, remains as a permanent document of reggae's commercial growing pains. 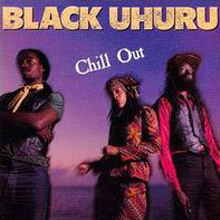 Chill Out is an album by reggae band Black Uhuru, released in 1982. The album was recorded at Channel One Studios in Jamaica and produced by Sly &amp; Robbie. Featuring The Revolutionaries, an influential session group, Chill Out, together with its dub companion The Dub Factor, is widely considered a classic of reggae music. Arguably the best of Black Uhuru's electrofied albums, even if its predecessor Red was the bigger sell, Chill Out is a seminal blend of styles and cultures. Produced by Sly & Robbie at Channel One Studio in Jamaica, and again backed by the Revolutionaries, ironically the album's greatest beneficiaries were the Riddim Twins, who were rocketed to international fame upon this record's release. They deserved it though, and Chill Out remains as much a tribute to their talent as the vocal trio's. Shakespeare lays down the sinuous bass which provides the foundation for the record's rootsy sound. The four guitarists, three leads, plus Ranchie McLean's reggae riffing, flit across the grooves and genres, touching down on funk, blues, R&B, and rock along the way. The pianists and Wally Badarou's synth add atmosphere, with Dunbar's heavy beats, combining drums with electro syndrums, add a throbbing pulse to the proceedings. The sound is extremely dense, but the producers still found plenty of space for Black Uhuru's sublime vocals. Over, under, and around the band, the electronic effects whoosh, pulling the album from its island roots, and planting it firmly in an international environment. This is most notable on the title track, which blends rootsy rhythms with a dance beat, and urban stylings with a tinge of world music. "Darkness" is an equally adept meld of roots with new wave touches. If the album's A-side is weighted more towards the crossover crowd, the flip is rootsier in orientation, even if it, too, is awash in electronics. Several of the songs, minus the studio wizardry, would slot nicely into the group's late-'70s repertoire, particularly "Mondays" and "Wicked Act." The most affecting and effective track, however, is the ghetto misery of "Emotional Slaughter," which Sly & Robbie sympathetically arrange as a showcase for Michael Rose's superbly heartfelt vocal performance. On Chill Out, the vocalists, band, and producers came together as one, and created more than a masterpiece; the album remains a stunning legacy for all involved. The sophomore release from the third and most successful incarnation of Black Uhuru (singers Don Carlos, Erroll "Jay" Wilson, and Rudolph "Garth" Dennis had come before), Red spotlights the singing talents of then rising star Michael Rose, American-born Sandra "Puma" Jones, and original member Derrick "Duckie" Simpson. Backed by the tight and dancehall-era defining Sly & Robbie band, the trio reels off eight high-quality reggae cuts here, including classics like "Youth of Eglington" and "Sponji Reggae." Filled with Rose's astute lyrics, the album provides an engaging blend of steppers rhythms and social commentary. Sly & Robbie's ingenious mix of sophisticated roots reggae and a variety of modern touches (synthesizers, electronic drums) not only brought Black Uhuru widespread fame but, along with Henry "Junjo" Lawes and Prince Jammy's contemporary productions, also helped define the slicked-up last stand of roots rhythms in the first half of the '80s, while foreshadowing reggae's coming digital age. A very enjoyable listen, recommended along with other fine offerings by the band like Chill Out and the Grammy-winning Anthem. 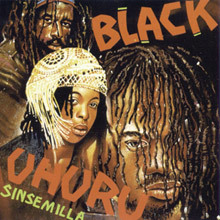 Released on the Island Records subsidiary Mango in July 1980, Sinsemilla, named after a type of marijuana, was Black Uhuru's first album to be issued internationally, their third overall. Released on the Island Records subsidiary Mango in July 1980, Sinsemilla, named after a type of marijuana, was Black Uhuru's first album to be issued internationally, their third overall. Although the group was nominally a trio at this point -- consisting of Derrick "Duckie" Simpson, Michael Rose, and Sandra "Puma" Jones -- in effect, Sinsemilla was a solo album by Rose, who wrote all the songs and sang lead vocals. In addition to his writing and singing duties, Rose can be credited for bringing in the production team and rhythm section of Sly Dunbar and Robbie Shakespeare, whose Taxi Gang provides the distinctive musical tracks. Rose's lyrical vision is revolutionary and radical, extolling the primacy of Africa, opposing apartheid, and praising the virtues of marijuana. But his sweet tenor and Simpson's harmonies soothe the message, and the music has a spare, rhythmic appeal that is distinctive and forward-looking, suggesting a hard, stripped-down direction for reggae. Sinsemilla is the sound of performers just finding their voices, and it excited hopes for the development of Jamaican music as Bob Marley's leadership was about to falter due to illness. 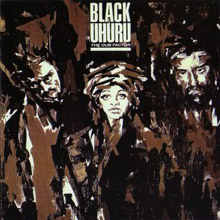 Released the same year as their Grammy-winning Anthem album, Black Uhuru's The Dub Factor figures as one of the most impressive of reggae's electronic age dub releases. Bristling from the fine mixing work of Soljie and Maxie, the album is basically a reworking of the band's breakthrough Chill Out release from the year before, albeit in often unrecognizable form. But if you like your dub with a healthy dose of apocalyptic effects from syndrums, synthesizers, and mixing board alike, then The Dub Factor will do the trick. More than just a empty exercise in knob twiddling, this Black Uhuru dub excursion by Sly &amp; Robbie will no doubt please both fans of the group and habituates of quality dub titles. 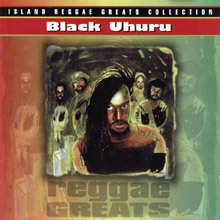 Reggae Greats is a straight CD release of Black Uhuru's 1985 LP of the same title that collected the best tracks from the group's four early-'80s studio albums for Island Records. This was arguably the peak incarnation of the band, and certainly the most stable lineup, with Michael Rose handling the lead vocals, Duckie Simpson and Puma Jones taking care of the harmonies, and the world-class reggae rhythm section of Sly Dunbar on drums and Robbie Shakespeare on bass holding it all down and also providing production direction. The backing tracks are rhythmic, atmospheric delights, full of unexpected, chiming percussion touches that give everything a bright shine, even as the subject matter of the songs veers firmly into political and social territory. Included are "Happiness," "World Is Africa," and "Push Push" from 1980's Sinsemilla, "Youth of Eglington" and "Sponji Reggae" from 1981's Red, "Darkness" and "Right Stuff" from 1982's Chill Out, and "What Is Life," "Bull in the Pen," and "Elements" from 1983's Anthem. There are anthologies available that chart the complete history of Black Uhuru, but these are the key tracks from the albums that gave the group its international audience. Unfortunately, when the Island contract ended, so did this version of the band. 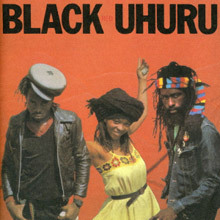 During the band's heyday in the late '70s and early '80s, Black Uhuru was one of the most unique and influential reggae bands in the world. This was partly due to their distinctive vocal sound -- which was dominated by the keening wail of Michael Rose and the haunting harmonies of American expatriate Puma Jones -- but in large part it was also due to their backing band, which was led by the legendary drum-and-bass duo of Sly Dunbar and Robbie Shakespeare and was one of the few that could challenge the Wailers in terms of telepathic tightness and sheer rhythmic wallop. Liberation goes one better than most retrospective compilations: instead of simply collecting two discs' worth of previously released singles and selected album tracks, it takes familiar songs (such as the anthemic "I Love King Selassie" and the apocalyptic "Guess Who's Coming to Dinner") and presents them in live versions, early mixes, 12" "showcase" versions (wherein the dub mix follows without a break on the heels of the vocal mix), and more. Little of this material is actually rare, and a good chunk of it actually does consist of standard singles and album tracks. But the rarities are plentiful enough to please fans, while the two-disc program is comprehensive enough to serve as a fine overview for beginners. Highlights abound, but they particularly include the showcase version of "Darkness" and the 12" mix of "Sponji Reggae." Excellent. A reasonable if abbreviated summation of one of the most popular reggae bands of the '80s, this bargain-priced, 11-track collection is nonetheless a compelling listening. It covers the highlights of their four studio Island albums, adding the "Guess Who's Coming to Dinner" B-side of the "Sinsemilla" 12". Uhuru was helmed on these tracks by the producer/rhythm section of Sly Dunbar and Robbie Shakespeare. Their crisp rhythms, rugged playing, memorable riffs, and intricate studio touches like the chiming glockenspiel on the chorus of "Sponji Reggae" nearly burst out of the speakers. 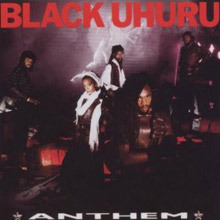 Although backing vocalists Puma Jones and Duckie Simpson provide minor supporting roles next to Michael Rose's distinctive leads, the music's gripping melodies, vocal harmonies, and cracking backbeat gave Black Uhuru a unique identity. They never duplicated the formula after winning the first Grammy for Best Reggae Album in 1985 and subsequently left Island. The remastered audio on this collection is stunning. It reveals subtle sounds that had been previously hidden and adds a confident presence. The song's shorter versions are used, resulting in a more dynamic listening experience as opposed to the double-disc Liberation, which featured extended mixes. The absence of "Shine Eye Gal" from the Tear It Up live album makes this only slightly less comprehensive than it could have been as a compilation of Black Uhuru's most important years. 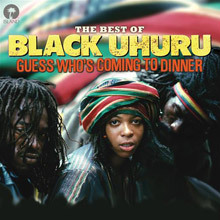 ‘Guess Who’s Coming To Dinner’ includes all of Black Uhuru’s most important works for Island, along with their two UK chart hits, ‘What Is Life’ and ‘The Great Train Robbery’. 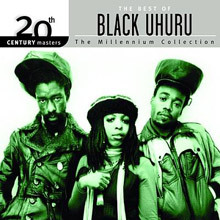 The title of this greatest hits collection is also the name of an earlier album that featured five minute long track of the same name, a track that is quintessential Black Uhuru. The band that became the undisputed leaders of Roots Reggae in Jamaica and beyond after Bob Marley's passing.